This bulletin was issued in Topeka, Kansas, on October 4th, 1879. It was published by Merifield & Swayze. It provides advertising messages and programs such as the comedy drama "MATINEE" and "FLIRTATION, or Love at Long Branch". It was the last issue of a short-lived publication that provided information about activities, advertisements for Topeka businesses and some informational articles. 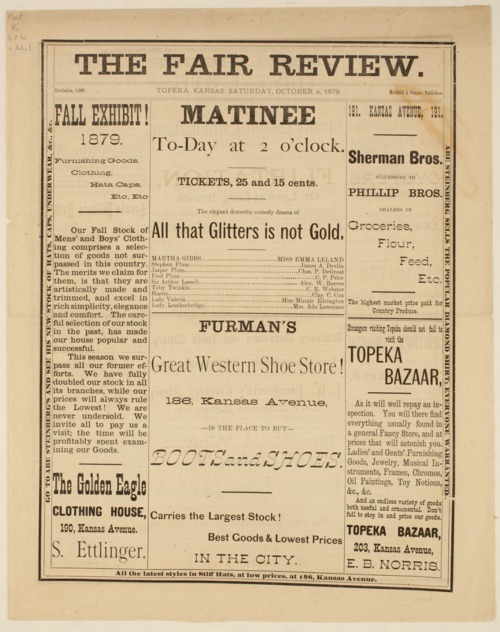 The Fair Review was published during a fair held in Topeka in the fall of 1879.